Over at Splitcoast today we’re doing the Ways to Use It Challenge. Our theme is “Baby It’s Cold Outside”. Isn’t this just the cutest image? It’s been die cut and colored with Copics. Then I added some bling with a Gelly Roll Stardust pen and added some Polar White Flowersoft on the fur of both their hats and the trim on her jacket. 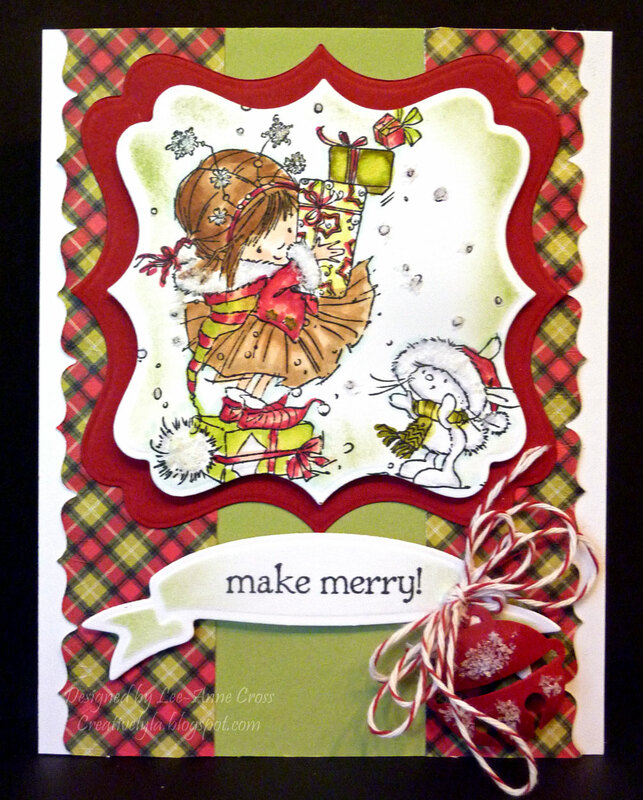 The image was also sponged in the die and layered over a slightly larger die cut. I’ve used a Spellbinders Edgeabilities die for the pieces of plaid designer papers and they’ve been layered over some plain white card stock. As usual, this is standard A2 card base. The sentiment has been stamped, die cut and sponged. Then I’ve looped some baker’s twine and tied it around my little punched bell. To add dimension to the bell, it’s been placed on a craft molding mat and shaped with a stylus. Then I added a little more Flowersoft on the bell too.